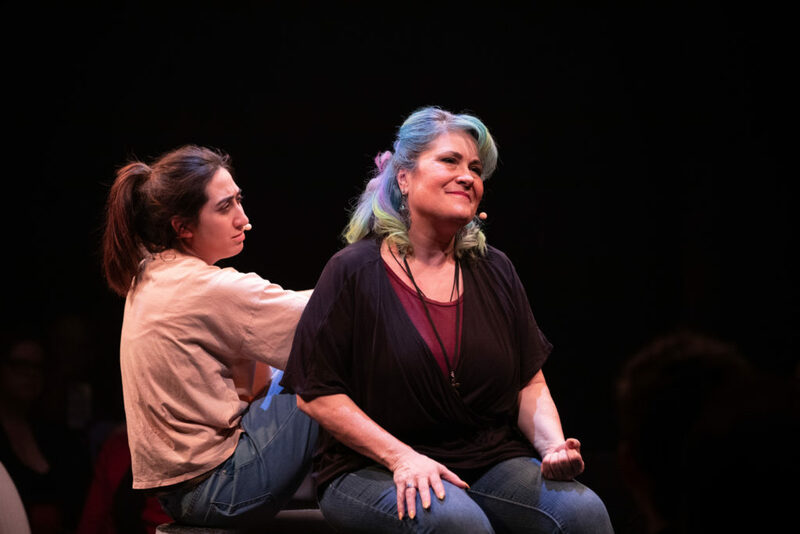 (Cambridge, MA) Miss You Like Hell is a very special show that approaches the indigenous, female experience from an approachable angle. It is easy to enjoy this production (more so than its individual parts). It’s main characters are expressed as trustworthy humans who are deserving of our compassion because they need it, not because they’ve earned it. Audiences from all backgrounds should see this production. We need free-flowing compassion more than ever. This musical is performed in-the-round with a mic-ed, live band. The set design by Erik D. Diaz is simple but impressive. It acts as storage and transports like a dream. David Coleman’s band disappears naturally into the space. They are just as much a part of the environment as the street signs and bar. A warning: If you need them, bring earplugs. Carlisle-Zepeda and Hernandez deliver solid, unprecedentedly prophetic performances as mother and daughter. As Beatriz and Olivia, they are the neighbors we fight for when we reject Trump’s pointless wall and other racist demands. Carlisle-Zepeda’s free spirit is contagious. Her calling upon her “witchy-witches” in English speaks of a deeper understanding of what it means to be American. Hernandez has a gorgeous, expressive belt that echoes across Club Oberon in numbers such as “Bibliography” and the title number. They make a sympathetic team (their bickering and loving make me miss my own mother. If you have a mother-figure who loves you, please call her.). The original cast-recording heard on its own is not a comprehensive listen. McKeown plays with form and musical cohesion. The number that sticks out as irregular is “Yellowstone” an R&B ode to our national park sung by Pearl. Murchison (with Williams’ direction) makes sense of this number with her characterization and energy. It no longer sticks out like a sore thumb. The dramaturgy work by Montez and assistant dramaturg Stephanie Engel is top notch. If you know nothing about the production, please give yourself time to thoroughly read the programme. Montez and Stephanie Engel have given us everything we need to know about Olivia and Beatriz’s world. Their work on tamales is delicious and proves that there should be more tamales-related dramaturgy. There were more women than men at this performance. This is not a show “for women.” Women make up 48% – 52% of the population. If I’m expected to get something universal from any of them male-dominated theatre pieces, men can sit still and look pretty during this one. Miss You Like Hell a show for everyone. Errata: The audience can see the cell phone screens of the actors. It behooves the props and tech departments to create both a Castaways blog and a scrollable dialogue PDF for the actors to use during the show. Carlisle-Zepeda’s witchy-finger manicure is really nice touch. Club Oberon offers a fantastic bargain to theatre companies that use its space. Oberon doesn’t charge it’s visiting theatres rent if the bar fulfills a purchase quota. Please buy a drink and tip well. That goes extra for the visiting theatre-community members who attend. Help a theatre out by having a good time. Should this musical reach you on a humanitarian level, please consider contributing to community partners ACLU Massachusetts, Agencia Alpha which works to integrate immigrants into society, Boston Glow which empowers female leadership, Chica Project provides economic opportunities to young Latinas, and Zumix which builds community through music and creative technology. Our cheeto-bedazzled, tiny-handed, broke, fascist president wants to build a wall that Mexico won’t pay for to keep out the immigrants who arrive by airplane. Flint, Michigan still doesn’t have clean water; Puerto Rico can’t afford a stable infrastructure. Trump’s shutdown is harming national parks. His wall is endangering wildlife and civilians. These aren’t just acts of narcissistic stupidity; they are actively harmful to the very people Trump claimed he would help. Let Miss You Like Hell be the reason you ponder the state of our government. Vote in your next elections. Offer kindness as currency that you’ll never run out of. Treat all people with the dignity and compassion they deserve. Do it because it’s free and because you can. This entry was posted in Uncategorized and tagged Evgenia Eliseeva by Kitty Drexel. Bookmark the permalink.